Someone around here jumped the gun here on early harvested tomatoes and I came home the other day and found a bowl of les tomates Campari in a little paper sack, in the kitchen. Since they weren’t as nice and softened as a full-on ripe tomato should be, instead of eating them on their own, I oven-roasted them, which is a great way to coax out flavor from less-than-pristine tomatoes. This is the perfect technique for both concentrating flavor and preserving tomatoes, something I also do at the end of the season. Then I freeze them in portions to use for a quick pasta or lasagna sauce in the fall and winter. Because fresh tomatoes come from plants, and aren’t standardized (or at least they shouldn’t be) – moisture, ripeness, and variety are some of the various factors that come in to play – so the roasting time may vary. It’s kind of hard to overcook them, but do check them as they’re roasting every once in a while to monitor their progress. I especially like to roast tomatoes when I have something else in the oven, because I don’t always want to keep the oven lit, especially in the summer. If I’m making something that requires a higher oven temperature, I’ll put them in the oven, too, then turn the oven off and let them coast to the finish. If you’re one of those folks who doesn’t like tomato skins (I’ve seen people push them to the side, but I eat them), they’ll slide right off after baking. I add fresh garlic, sliced, rather than minced, because the long-roasting brings out the sweetness in garlic, and it’s nice to get substantial bites of garlic along with the meaty tomatoes rather than little bits that wither away. Then I smushed down a few tomatoes on it, topped it with crumbled feta, and scattered a fresh herbs on top. While we were sitting outside, drinking glasses of chilled wine and enjoying the marvelous spring weather, a few neighbors came by and joined us. I was happy that I had extra tomatoes on hand..and so were they! This recipe can easily be increased. 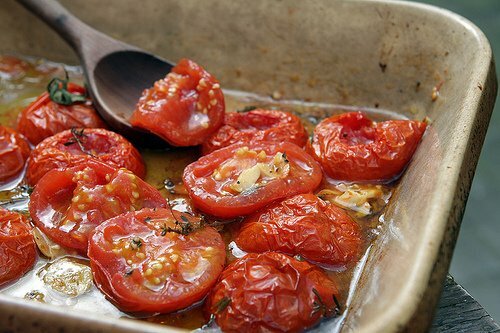 The important thing is to use a baking dish or pan big enough so that they tomatoes are not too crowded. You want room between them for the moisture to escape, which concentrates the tomato flavor. If you use a metal pan, make sure it’s not aluminum or made of another material that might react with the acidic fruits.And it’s up to you if you want to cut out the stems before roasting or not. You can see here I did some, but not the others (for whatever reason was running through my mind at the time.) The herbs can vary as well; basil, oregano, or marjoram all pair nicely with tomatoes. 2. 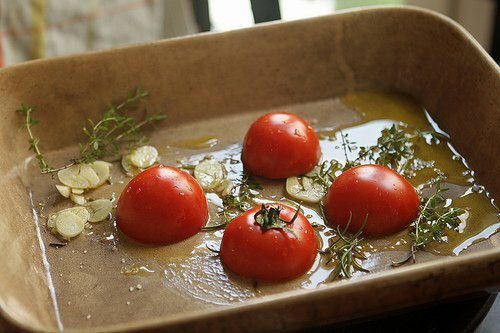 Pour the olive oil into a shallow baking dish or pan and add the garlic, thyme, rosemary, and salt and pepper. 3. 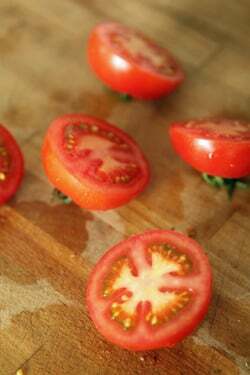 Cut the tomatoes in half horizontally, then use a sharp knife to remove the stems, if you wish. 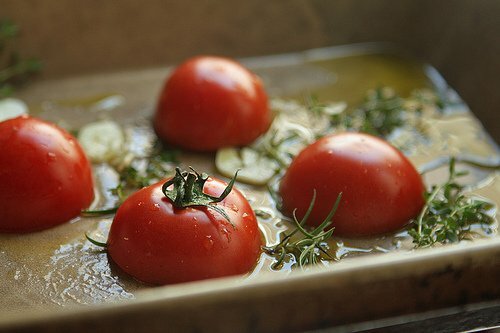 Toss the tomatoes with the oil and seasonings, then lay them cut side down in the dish. 4. Bake for two hours, or until the tomatoes are completely softened and wilted, and start to wrinkle. Depending on the tomatoes, they may take longer to cook. Hi David – these tomatoes look delicious. A couple of years ago, we went apple picking and the farm had red & yellow grape tomatoes on the vine to pick. I picked a bunch and that’s how I started roasting tomatoes at home with some olive oil and herbs. It is so simple and tasty. I cook some pasta and put it right in the pan the tomatoes were roasted in and toss for a hearty dinner. My favorite thing to do all summer – put them on everything or just pop them in my mouth. 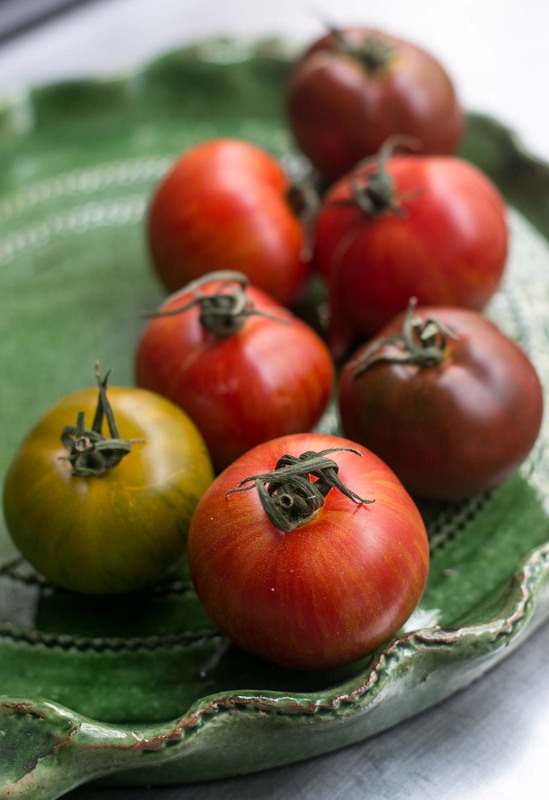 I am enamored of a summer tomato recipe that does not require peeling and seeding. It’s the lazybones way of preserving tomatoes. David, such a simple, yet beautiful and delicious dish. Perfect for summer! It’s one of my favorite things to eat- and sometimes I even roast them longer… until they are shriveled to extreme and you can just pick them up and eat them- easiest to do with the smaller tomatoes. Thanks for the reminder… this is on my list to make on our beach vacation! I am drooling over that picture! I was also thinking, that they would make a lovely tomato tart…. I’m really glad that you posted this now because I was just getting sad that I wasn’t in the mood for roasted stuff anymore. Florida gets so hot right now and it’s hard to find an excuse to turn on the oven. But roasting tomatoes will be perfect actually, because they don’t taste heavy like winter veggies and are a perfect light snack just on their own!! Thanks for the reminder about how delicious and easy roasted tomatoes are…it’s definitely that time of year when vendors are rushing to get tomatoes out a little ahead of schedule! That dinner of tomatoes, bread, feta and wine sounds perfect. Roasted tomatoes are my idea of heaven – these look fantastic! This is one of my favorite ways to keep tomatoes around in the winter. I buy cases of plum tomatoes in September to roast and freeze, then cook with them all winter long. 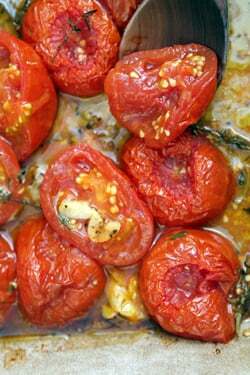 I love rosemary but have never used it with roasted tomatoes–I’ll try that next time! As it happens, I just discovered this method of cooking a couple of months ago and have fallen in love with it. I don’t like mine to have any hint of “stewed tomatoes” to it, so I cook the heck out of them. Last batch I roasted for 4 hours at about 300. They are blackened in spots, hardly any liquid left, and are reminiscent (not surprisingly) of sun-dried tomatoes. Love! I do a similar thing but I roast them much longer, usually 6 hours at a lower temperature. When they come out they are sweet and sticky and almost syrupy. For me, I like to use Herbs de Provence to season them with. I’m definitely going to try your method though when I need a quicker fix! It’s great for so-so tomatoes, or good ones that you’ve bought too many of, but I’ve found cherry tomatoes are best. If you find some really stellar cherry tomatoes, roast them whole until they collapse and toss with pasta, more olive oil and chopped parsley. Plus a sharp/salty aged cheese like pecorino or asiago, tho’ feta sounds like it would be worth a try. Redd, Amy, and Lori: Yes, you could certainly cook them longer. However I have a little trouble (because I’m so frugal!) keeping the oven on for hours and hours. So when I want dried tomatoes, or close to dried, I dig into my stash that I bring back from Italy. But you’re right – they can be roasted longer, when they become chewy and drier. Phillip: I love cherry tomatoes wilted on pasta. It’s very hard to find good tomatoes in Paris, not matter what the season, but we do get a lot of cherry tomatoes, and I use those when I need a pasta-tomato fix, fast. Susan: I presume you’re talking about those “on the vine” tomatoes, that are bright red and sold with the stems attached, but have little flavor. I don’t buy those unless I really need “fresh” tomatoes for something, but it’s certainly better to wait for summer. Do you eat the leaves? Katie: I’ve never eaten a tomato leaf. There have been some questions about their toxicity, although Harold McGee wrote more about tomato leaves and whether or not they are edible. One of my fav ways to enjoy tomatoes! Simply lovely. David, this is great, I have a half used carton of organic tomatoes from Costco I was wondering what to do with–this would be perfect. Dorie Greenspan has a similar recipe, except she roasts hers for longer at a lower temperature. 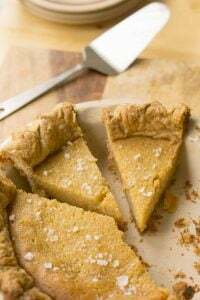 Depending on my afternoon schedule today, will do either your version or Dorie’s :) Thank you for this great blog post, gave me the idea to try this recipe! One of my favorite things to do with smaller tomatoes (Juliet work really well for this) is dry them. Slice them in half, put them on parchment paper on a baking sheet, and bake at 200 F (or lower if your oven goes lower) for ~12 hours, or until mostly dry. Thanks so much for mentioning that you freeze these. Here in south Texas our tomatoes are coming in by the bucketfuls and I hadn’t decided how I was going to put them up. I love roasted tomatoes anyway, so this is perfect. Thanks again. A good Italian friend taught me a dish with the tomatoes cooked the same way but take them out after an hour, spread cooked rice mixed with Parmesan cheese, butter, parsley into the tomato juices and cooked tomatoes (or stuff the tomatoes with the rice) let bake some more until some of the rice is golden, crispy, and the juices are bubbling. Delicious! My favourite thing to do with tomatoes!!! Like the othere have posted, I do some to about this consistency, and then some to the longer roast time so they come out drier and chewy- I made it for my young nieces and nephews and told them it was “tomato candy”- they gobbled it up!!! I do this, but at a much higher temperature. Delicious! I also roast peppers this way and freeze for pasta sauces. And for bruschette, bien sur. A process question, please. If you want the moisture to evaporate, why not put the tomatoes cut side up? Does it have something to do with the skin? Thx. I have 4 tomato plants (and some seedlings) in the garden I started this year. I can’t wait to use this idea to save some of the goodness. mmm that little meal of bread and tomatoes sounds just lovely. David this is perfect timing, I’ve finally bought an ice cream churner of my own and one of my first experiments is to be Roast Tomato gelato. I will use your gorgeous method (sans garlic, I think) and let you know how it goes. Tina: I think the direct heat of the pan or baking dish, when it comes in contact with the watery cut-side, helps “singe” the heat out of the tomatoes. It’s just a hunch and I’ve not done two batches side-by-side; I’ve just always oven-roasted tomatoes this way. KC: I’ve been updating in my newsletter. I didn’t want it to take over the blog, but at some point in the future, I may do something here. Noah, Lucille & jennifer: Some folks do roast their tomatoes longer, which is why I kinda mentioned folks can let ’em go a while longer. I do have a hard time keeping my oven going for hours and hours and hours, just because I’ve got my eye on my electric bill (!) – but someone once lent me a dehydrator, which I loved, although I hear they use a lot of energy as well. Oh, how I love oven-roasted tomatoes! I roast ’em for about 2 hrs at 350F (I use Romas), seasoned with sliced garlic & olive oil, until most of the juice has been absorbed & the edges of the tomatoes have caramelized. 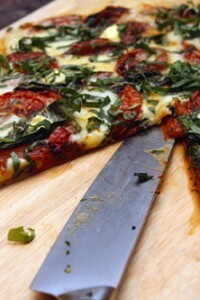 We eat them on manoucher, each tomato half topped with fresh basil & a slice of mozzarella. This also makes a great do-ahead party finger food. This is my FAVORITE way to cook tomatoes. I have an aversion to raw tomatoes but roasted is the way to go! I don’t peel my garlic though. I just throw 5-6 unpeeled cloves in with the tomatoes and savory their smushy goodness on a baguette. This was always one of my favorite things to do with tomatoes. I also like to roast of tomatoes and use them in place of sauce on a thin crusted pizza. Lil feta, kalamata olives and roasted red peppers on top of that with a dash of olive oil.. mmm Thank you for reminding me of this. I love these Tomates Confites as they remind me of Summer time. I also slow cook zucchini tagliatelles like that and make a tian ( alternating rows of tomatoes and zucchini). Viva l’été and thanks for the beautifl photo. David, you seem to have the perfect life. Your blog and books bring joy to those of us who fondly remember Paris but no longer travel. I would like to know more about your life. Would you please write a lifestyle book for your many fans. What can be better than a perfect tomato! 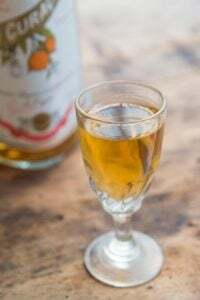 A renowned French perfumer Jean-Claude Ellena (a great cook, by the way, as most noses tend to be) likes to use a combination of tomato leaf and rose in his fragrances (Hermes Rose Ikebana, for instance). So, I decided to steep a couple of leaves in the syrup when I was making raspberry-rose sorbet. 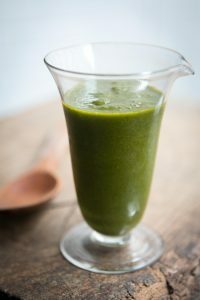 It turned out to be a nice discovery–the green note of tomato leaf made the raspberry seem even sweeter and richer. 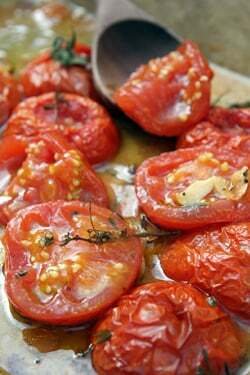 The tomatoes look wonderful and there are so many delicious things to be done with roasted tomatoes. Love the idea of preserving them this way, rather than the usual way, and wonder why I didn’t think of it before. I did run across a good thing to do with those flavorful little grape tomatoes, and it is just a matter of slicing them in half, (about 2 cups halved) adding 1/2 cup of chopped fresh basil, a couple of minced garlic cloves, a few tbsp of olive oil, and salt and pepper. If this is prepared in the morning, in can be left on the counter to marinate all day. Then, all one has to do is cook some pasta, drain, and add the tomatoes and marinade and toss in some cheese. Or, as I often do…just eat the marinated tomatoes! Either way, quick, easy, and so very good. SO SIMPLE, SO WONDERFUL, THANK YOU. LOOK FORWARD TO EVERY WORD YOU HAVE TO SAY. Beautiful, and am definitely going to try this! Thanks David. Thank you, too, for the phrase, ‘Because tomatoes aren’t standardized”… standardized, a word I wish I had thought of long ago. When I make my home made spaghetti sauce, I often get “hmmm, this is great, but did you use that same recipe ? ?” Grace a vous, I now have the PERFECT response! Roasted tomatoes in place of unroasted give gazpacho an added depth and slight smokiness. Yum. Last night I saw a show where they smashed tomatoes to show what happens to your brain when you ride your bike without your helmet because you don’t want to mess up your hair. All I could think about were how watery and undelicious and hard those tomatoes looked. It would have been such a delicious play if they had only thought to oven roast those tomatoes first! What makes your cooking so delicious looking, are your faultless photos next to the always detailled recipes; you’re an example to all of us. Incidentally, this week I bought a ‘carton’ with 12 250gr boxes of yellow cherry tomatoes for a song at my local greengrocers (he must have been afraid of not selling all before Pentecost) and they are full of ripeness, taste and loveliness…. We’re just popping them in our mouth when passing the kitchen – made already a cold soup yesterday and will probably tomorrow cook some in a sauce with fresh rosmarin and garlic and flat parsley – because all this is available, the basil I sadly had to throw away after one day of wilting in its jar with water. Maybe you have a ‘conversation’ recipe when buying bunches?! Yes, a lot of the instructions in French cookbooks are quite vague. In France, there is levure chimique (baking powder) and levure de boulanger (yeast). It sounds to me like if it’s a cake recipe, it would be the first. 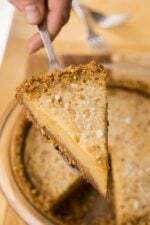 There’s some extra tips at my post, American Baking Ingredients in Paris. I love to do this with tomatoes. I freeze them in small portions so I can pull out a few when I want an out of season treat. I get so excited when I go to the freezer for something else & discover them! My tomato plants just went into the garden (I live close to the 45th parallel). I like to use paste tomatoes, Roma’s and San Marzano’s, for their flavor density and texture when roasted. I use whatever homegrown herbs are handy for a taste treat and lots of garlic; will occasionally roast onions and peppers if I’m planning on using the tomatoes for bruschette, sauce or pizza (plus the house smells great). I didn’t know I could freeze the tomatoes–a great idea! 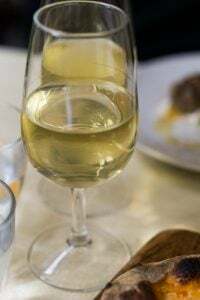 Thanks for a wonderful post and making me dream of summertime delights to come. I have been roasting tomatoes for decades – regular size tomatoes, cut side up on parchment paper, sprinkled with S&P, drizzled w/olive oil, overnight at 150 degrees. About 20-25 years ago I discovered a Super Velox World little tool (at Ratto’s in Oakland) which lets me feed the semi-dehydrated tomatoes into the hopper, then the peel, seeds, and stem point come out one side, the rest of the wonderful tomatoeness comes out the front (tomato, olive oil, S&P, garlic, herbs). I pack it up in freezer zip lock bags (a flattened bag about 3/4 inch thick when put in freezer) and use that all winter for soups, stews, sauces. I also do the same thing after roasting red/orange/yellow bell peppers on the grill. For the peppers, you can break off portions to use, then carefully reseal the bag to preserve the flavor. I love your presentations, thank you so much for sharing. 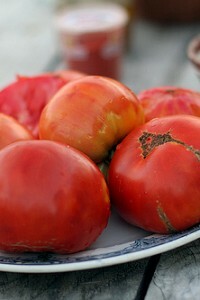 I love roasting tomatoes and have roasted quite a few batches of Campari tomatoes lately. I think they make the perfect side dish and your recipe for adding it on top of bread or bruschetta sounds fantastic. I might like that even better. I always put heavy duty foil down on my pan for easy clean up and have never tasted any metallic flavor on my tomatoes. However it’s a good point that I will consider next time. I wasn’t even thinking about the reaction that could occur when tomatoes come in contact with aluminum. David, How can I print your posts for the recipes and photos without all the comments that follow? I just followed the link and printed the recipe for the French Tomato Tart, and it printed 26 pages (!) because of the comments. I enjoy reading them but don’t want to include them in what I print and put in my recipe notebooks. Thanks, anyone! First time commenting, I love your blog and also just bought your ice cream book. The chocolate ice cream was excellent. Cheers! Keep up the great work. Also, I’m truly dying of curiosity to see your kitchen remodel progress. Could you please throw us a bone? I, too, would love to know how the kitchen remodel is coming….I keep watching for an update! And I frequently roast tomatoes like this. I love using them on pasta. I prefer using Herbes de Provence as the seasoning. Vicki: Am not a fan of foil, although I am a fan of easy clean up (!) Maybe try parchment paper instead..
Beverly: Because I started the blog when the idea of a “print option” didn’t exist, I don’t have one. If I started it now, I’d have to go back to over 1k blog entries and reformat them (any volunteers!?) – because if I just did them going forward, folks would wonder why the older ones weren’t formatted for printing. You can cut-and-paste the recipe into a Word Doc, or use a site like printwhatyouwant.com for printout out individual pages. David, I recently signed up for your newsletter but can’t figure out how to access previous editions from your website. Is there an archive? Merci. Deb over at smitten kitchen does a fabulous soup from roasted tomatoes that I used a lot this spring. I prefer the 2 hrs you mention though- I think it increases their sweetness especially with less than perfectly ripe ones! Just love your photographs and your blogs. When I was in school we were taught to think up a good ending sentences when we wrote about things. I always look for that……..You write terrific ending sentences. I actually make a delicious tomato soup like this with red peppers inspired by a Nigel Slater recipe. After roasting you add stock to the roasting tin and whizz up! 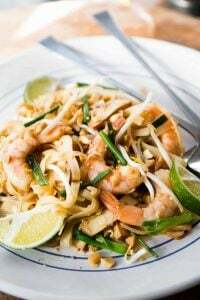 Its easy and very delicious, you can add chilli flakes to spice it up. Always good to have something on hand for neighbours for that all important apero time! Merci! Here in Marin, our Farmers mkts. are loading them up and I Loved roasted! Another great post but I’m taking away the idea of these tomatoes and making a soup. Perfect timing, David, I’ve been harvesting fresh tomatoes for about a week now and this lovely recipe is a must! Ever since I visited France in 2002 and was served the slow roasted tomatoes in a bar, I have been making them and my friends cannot get enough of them. Last week I had a batch in the oven (I cook them at 200 degrees for about 6-8 hours) I took out some but the others were not quite ready. It was late in the evening and I forgot about them, fell asleep and awoke the next morning to the smell of tomatoes. They had cooked for 15 hours. They were black and like crackers – but I’m still eating them. 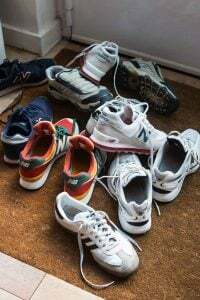 I am going to try your way of fixing them, and make sure I take them out in time. i so envy you living in france, have used this recipe with fish which is grilled, yum. Happy coolcookstyle told me about your blog. Beautiful. Nice pointer with the garlic: I’m off right now to get some produce (tomatoes were not, forcement, on my list) but I’m glad I thought to stop by before heading off. Roasted tomatoes would be too perfect tonight. I love roasted tomatoes! It’s one of my favorite ways to enjoy early tomatoes. We had some a few days ago with gnocchi and pesto. I have some more tomatoes on my counter ripening. I was thinking of turning them into a salsa for veggie tacos. Love all the pics of the process! Mmm they look gorgeous! And such a simple recipe too. Your tomato tart was my favorite new summer recipe last summer. I’m going to try your roasted tomatoes on our first cold, foggy summer Bay Area day after the tomatoes come rolling in. Basil showed up at the Berkeley Farmers’ Market this week. Wow those look delicious. 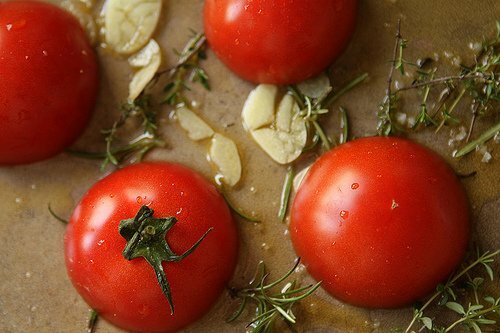 Last year I sliced cherry tomatoes in half and sauteed them on the stove with minced garlic and some herbs. I actually kind of improvised the recipe on the spot but it was delicious! Even my younger sister who usually HATES tomatoes admitted that they were really good. David, you say you are frugal and I was wondering if you have ever tried to actually use the sun as your heat to cook tomatoes. Paris summers can be pretty balmy but maybe the air is not all that clean? Many, many years ago, Laurie Colwin wrote an essay in one of her books about a roasted tomato dish she had at an event and this sounds very much like it. She wrote how she ate huge quantities of it and then snagged a waiter to learn how it was made and all he said was roasting them for a long time with some garlic and herbs. Thanks for the push to make it for myself finally! Thank you for this! 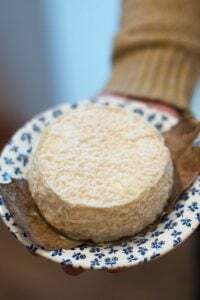 I made these the other night with intention of putting them in a sauce but my husband and I ended up them on a fresh baguette sprinkled with a bit of parmiagan-reggiano cheese – better than any bruschetta I’ve ever tasted. Thanks! I have everything I need waiting in my garden. The tomatoes are almost ready and this is just the recipe I was looking for. I’ve been looking for a good recipe for this! This is a delicious idea and recipe. We put the tomatoes over pasta with homemade parmesan/garlic breadcrumbs on top. I think we may have this again tomorrow.. Thank you for the inspiration and your recipe. So good. Hi! I was wondering how you frezze the tomatoes…I know you put them in the frezzer! But what do you put them in?? I put them in zip-top freezer bags, which are great because you can store them pretty flat and they don’t take up a lot of room in the freezer. My mouth is watering. 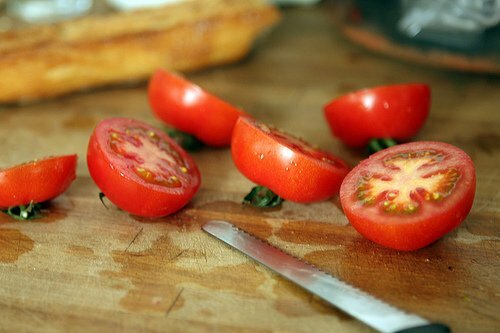 Your pictures are so beautiful and tempting, and I love how you maintain the integrity of the tomatoes with such a simple and rustic technique. 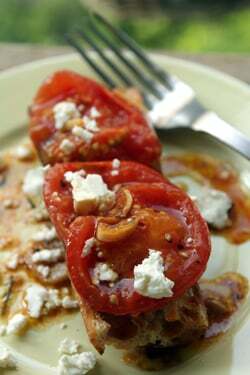 I roast tomatoes of all sorts all the time, but cannot wait to do it this way with grilled bread and crumbled feta. I have a dinner party coming up and tomatoes nearly ready in the garden. I think this will make a wonderful first course with the addition of some wild arugula I have growing as well. Yum! Made these last night. The tomatoes in my garden are just starting to ripen, but I had some store-bought, less-the-perfect ones sitting on the counter. After a long, slow roasting, they were no longer less-than-perfect! Thank you. Love the post. Looks delicious and very colorful. 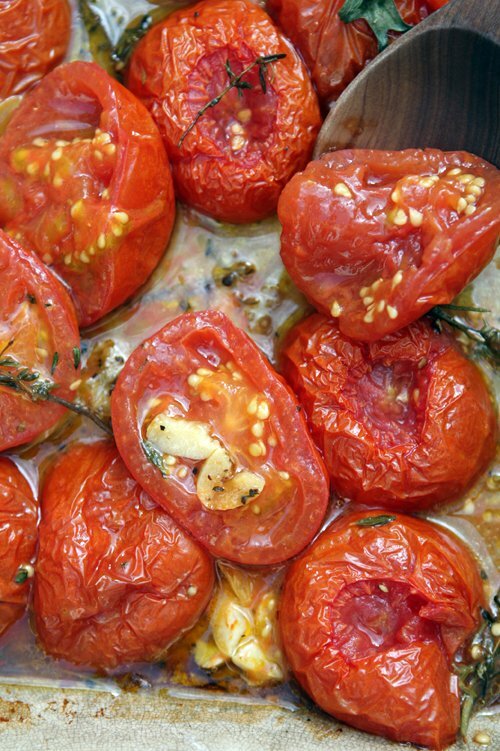 Roasted tomatoes are so versatile to add to so many recipes. My all time favorite. Thanks for sharing. I live south of Houston, Tx and have experimented growing and roasting different types of tomatoes over the last few years. I’ve found the “Husky Cherry Red” and the “Amish Paste Tomato” best for roasting. I cut the cherry tomatoes in half, place cut side up in a greased sheet pan and drizzle olive oil, sprinkle salt and a couple pinches of sugar over the top. Roast at 400 degrees for about 45 minutes (eyeball it), stir a couple times during cooking. The Amish Paste Tomato is larger and more meaty than the Roma. I usually quarter them depending on the size and cook the same as the cherries, maybe a little longer. Roasting tomatoes makes the flavor “pop”. Freeze in small 1-3 oz containers– add to pasta, over baked chicken, in soups and so many other recipes. Be creative!